Adrienne Dresevic and Clinton Mikel from The Health Law Partners, P.C., have won the Burton Award for Distinguished Legal Writing. The award ceremony will be held on May 23, 2016 in Washington, D.C., at the Library of Congress. Founding Sharholder Adrienne Dresevic (left) and Partner Clinton Mikel (right), 2016 recipients of the Burton Award for Distinguished Legal Writing. Founding Shareholder Adrienne Dresevic, and Partner Clinton Mikel, have been announced as 2016 Burton Award winners for Distinguished Legal Writing. This award honors 35 authors from the nation’s top 1,000 largest law firms who demonstrate great achievements in law and emphasize a special passion for legal writing. The Burton Awards, an academic, nonprofit foundation for Legal Achievement, is held in Association with the Library of Congress and Co-Sponsored by the American Bar Association (ABA). The Academic Board that chose the winners carefully reviewed the submitted articles and unanimously decided on the winning authors. The Board committee included many prestigious professors from Harvard, Stanford and UC Berkeley Law Schools, as well as a Judge from the California Superior Court, a former Chair of the White House Plain Language Committee, and the Founding Chair of the event. Dresevic and Mikel received the award for their article titled, “Final CY 2016 Stark Law Changes – Welcomed Revisions to Stark,” which provides guidance to health care providers on, and meticulously dissects, recent major revisions to the Physician Self-Referral Law, also known as the Stark Law. The final regulations were published by the Centers for Medicare & Medicaid Services (CMS) in the Federal Register on November 5, 2015, and are the first major changes to the Stark Law since 2009. The stated purpose of the revisions are to accommodate health care delivery and payment system reform, clarify certain applications of the Stark Law, and reduce burdens associated with and facilitate compliance with the Stark Law. The award ceremony will be held on May 23, 2016, in Washington, D.C., at the Library of Congress. U.S. Supreme Court Justice Stephen Breyer will be the featured guest speaker as well as U.S. Supreme Court Justice Ruth Bader Ginsburg, who will memorialize Justice Scalia during the program. Dresevic is a Founding Shareholder of The Health Law Partners, P.C., a national law firm focusing on healthcare legal issues. She practices out of her firm’s Michigan office, but is also licensed in New York. She practices in all areas of healthcare law, including providing clients with counsel regarding healthcare compliance, Stark Law, Anti-Kickback Statute, and False Claims Act defense issues. Dresevic currently serves as a member of the Governing Council of the Health Law Section of the American Bar Association (ABA). In addition to her role on the Council, she is also the Co-Chair of the ABA Physician Legal Issues Conference, and the former Chair of the ABA Health Law Section’s Publications Committee. Dresevic is a prolific speaker, writer and commentator in the healthcare industry, and is regularly sought out for her expertise. She is a graduate of Wayne State University School of Law. Mikel is a Partner with The Health Law Partners, P.C. He practices out of his firm’s Michigan office, but is also licensed in California, New York, and Georgia. Mikel practices in all areas of healthcare law, including providing clients with counsel regarding healthcare compliance, telehealth/telemedicine, privacy/security, Stark Law, Anti-Kickback Statute, and False Claims Act defense issues. He is the current Chair of the American Bar Association (ABA), Health Law Section’s: (i) Stark and Anti-Kickback Fraud and Abuse Toolkit; and (ii) eHealth, Privacy & Security Interest Group. Mikel is a prolific speaker, writer and commentator in the healthcare industry, and is regularly sought out for his expertise. He is a graduate of Cornell University and the University of Michigan Law School. Southfield, Mich.- based The Health Law Partners, P.C. (HLP) is a law firm dedicated to the practice of health care law. The firm takes pride in delivering results for their clients and their exceedingly high standards for service. Established in 2009 by Adrienne Dresevic, Jessica Gustafson, Robert Iwrey, Carey Kalmowitz, and Abby Pendleton, the firm has built a national network. Clients include hospitals and health systems, medical device manufacturers, pharmaceutical companies, group practices, physicians, hospice organizations, health information technology companies, and nearly every other type of provider/supplier in the health care industry. The firm has extensive knowledge and experience in Stark and Anti-Kickback compliance, health care billing and reimbursement issues, health care transactional work, Medicare and Medicaid appeals, licensing issues (physician and staff privileging), participation with third-party payers, health information privacy, telemedicine and eHealth issues, and all other regulatory issues facing health care providers and suppliers. HLP attorneys are adept at providing post-audit defense and appeals, a specialty that also provides them with valuable insight and experience into the compliance side of the legal equation—identifying and addressing avoidable vulnerabilities and exposures. For more information, please visit http://www.thehealthlawpartners.com. 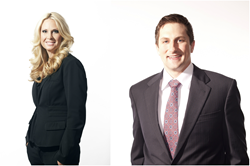 "Final CY Stark Law Changes - Welcomed Revisions to Stark" article written by Adrienne Dresevic and Clinton Mikel.